From inherited solid wood furniture to vintage porcelain plates, antiques are undoubtedly valuable and, in most cases, irreplaceable to their owners. Moreover, many of them possess not only monetary but also sentimental value. There are also museum quality antiques that are additionally highly collectible, like this amazing Chinese vase purchased by one of our clients from Sotheby’s. 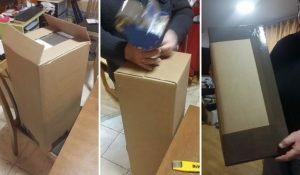 Anyway, whether it comes to your family heirlooms or a true masterpiece estimated at tens or even hundreds of thousands of dollars, you do not want any of them to be damaged in transit. So what is the proper way of packing and shipping antiques? It is needless to say that when it comes to packing and shipping antiques, there is no better way to ensure they arrive at the destination intact than entrusting this job to a reliable fine art shipping company. Fine Art Shippers is just the right choice in such a situation. Possessing 20+ years of experience, we are proficient in both proper packing and shipping antiques to anywhere in the world. 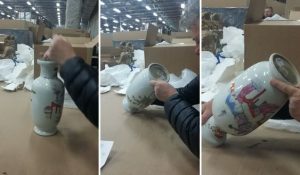 Below are several photos showing our team picking up an antique porcelain vase from Sotheby’s newly established location in New Jersey. 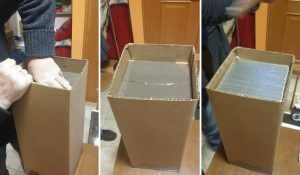 The vase was properly packed for its further transportation to our special client, using triple cardboard, foam, soft paper, and other reliable packing materials required to protect such a fragile item in transit. 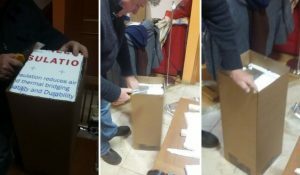 The whole process of picking up and packing was smooth and hassle-free, and took our team of professional auction shippers less than 30 minutes to complete. Working with Sotheby’s is always a wonderful experience for Fine Art Shippers, and we do enjoy picking up art and antiques from this renowned auction house. While soft packing is good for the local moving of art and antiques, long-distance transportation requires each item to be additionally crated. This is especially true when it comes to shipping antiques overseas. In such a case, we always build custom wooden crates for the transported items in one of our warehouses, thus providing them with the utmost protection in transit. Moreover, it won’t be an exaggeration to say that our crates are some of the best in the Tri-State Area, which allows us to guarantee that even the most fragile and delicate antiques always arrive at their destination in perfect condition. From packing and crating to shipping antiques, Fine Art Shippers will take care of every single step of the transportation process. Your treasured possessions are in safe hands with us!